It's been a confusing year for fans of the farming simulation series formerly known as Harvest Moon. The series has a new publisher now, and its name has been changed to Story of Seasons, but the old publisher is making a new series under the old Harvest Moon name. 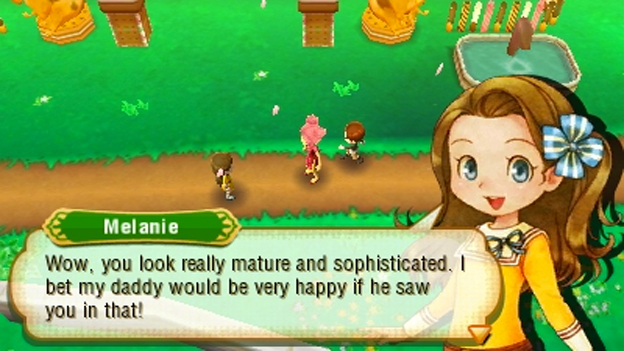 Let me make it clear: if you're looking for the continuation of the Harvest Moon games that you've played over the years, this one, Story of Seasons, is what you want. Got it? 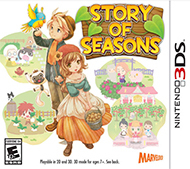 Good, because Story of Seasons is an excellent title that continues the ever-charming and slowly evolving farming sim experience that we all know and love. 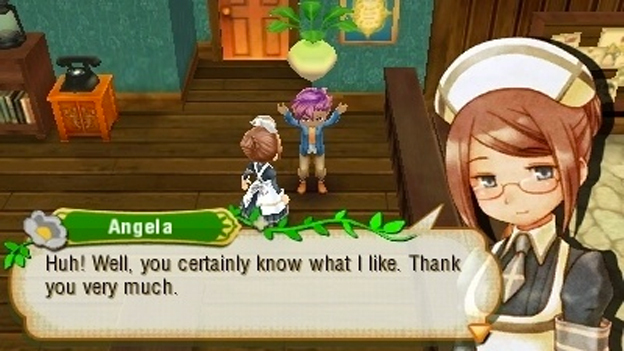 Like in the previous title, customization is the name of the game in Story of Seasons. You'll get to design your male or female farmer in more detail than ever before, plus you're able to build furniture, buildings, decorations, and farm equipment in order to make the dream farm of your choice. You can plow the whole thing under and plant a million strawberries, build up to four animal barns and turn the place into a zoo, or strive for a balanced approach that lets you dabble in a bit of everything. You no longer have to build the main town, but you'll gain the ability to decorate its many plazas as you progress through the game. It's a nice balance of customization and ease of use that should please the largest possible number of players. Farming has changed a fair bit, and mostly it's for the better. No longer are you working with individual crop plots. Instead, your hoeing, watering, and (finally!) harvesting work on an entire 3x3 crop plot at once. You won't have to spend forever winding up advanced harvest tools, either. Instead, the time you spend performing a single action like hoeing a plot actually decreases as you upgrade, which is the way it should always have been. While the day to day actions of farming have been streamlined, the big picture has become more complex. Your goal in this game is to build your town up as a trading hub by shipping tons of farm products and attracting new merchants to town. In an effort to increase productivity, the local guild has pitted you against four other farmers in a competition for public field space. Nobody can boot you off your farm, but if you want more real estate or to grow specialized items like honey and paddy crops, you'll have to beat your rivals at contests like earning the most money on a particular day or winning a local festival. This adds some interest and challenge to the game, though certain random elements can make challenges a bit frustrating at times. There are some drawbacks to the rental field system, though. It's a pain that you can't grow certain crops on your own land, and the rental fields are very spread apart. Worse, there are no options to get help for your farm. The Harvest Sprites, who traditionally helped with things like watering crops, are in evidence here, but instead of helping you out, they're content to wander the forest randomly. Lazy little boogers. You'll probably never want to grow crops on all the fields at once, even if you can, because there are too many other interesting things to do to spend all your time watering and fertilizing seeds. For instance, we know that the entire point for certain agriculturists out there is to find love and start a family down on the farm. 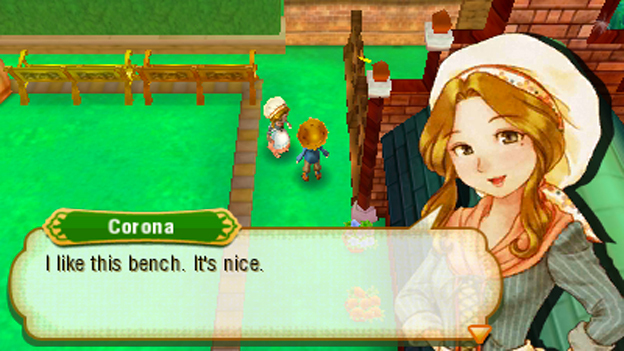 The quest for rural romance is greatly aided by a spirited English localization from new publisher XSEED Games. Your potential love interests and associated townsfolk sport vibrant and unique personalities without being too over-the-top. A couple townsfolk are certainly flamboyant, but that's consistent with their original design. As always, you'll have to give plenty of gifts to your potential significant other to earn his or her affection (sadly, all romances are strictly heterosexual), and it's worth befriending everybody in town to learn their stories and unlock cute little event cutscenes. This game's social element is reduced a bit by its focus on the trade depot, but its likeable townsfolk point to only good things for the series' future. Between farming, flirting, and finance, there's already plenty to do in Story of Seasons, but that's only scratching the surface. You can produce everything from new outfits to wine and cheese in special “maker” shacks that involve multi-step processes like turning wool to yarn to cloth to clothing. You can go fishing and catch bugs for some quick cash, and even swim around and dive for goodies in the local lakes and rivers. Later in the first year, you'll even unlock a safari that gives you access to the game's all-important mine and lets you play with wild animals that your trading partners donate once you've sufficiently befriended them. Since you can earn good profit by meeting the needs of your trade partners, it's well worth it to engage in all these activities and discover just how many different things you can produce and collect throughout the game. “Later in the first year” is an important phrase, though, because it takes a while to really get at the meat of Story of Seasons' gameplay. Things start off rather slow, as you start with only one trade partner and without the ability to do much but grow a couple crops and go bug-hunting during your first spring. If you're industrious, things really start to pick up in the game's third month, so much so that you'll feel a bit rushed if you start trying to do everything at once. The pacing is better than the excruciatingly slow tutorial month in A New Beginning, but veterans will still find themselves bored early on and new players overwhelmed once everything explodes onto the scene.